Winston Peters negotiated the roles of Deputy Prime Minister and Minister of Foreign Affairs. Some of his positions, especially on Russia, have been controversial – and somewhat mysterious. Guyon Espiner asks some pertinent questions, like What is Winston Peters’ foreign policy, anyway? To outsiders New Zealand foreign policy must look like a riddle wrapped in a mystery, perhaps clear only to the enigmatic deputy prime minister and New Zealand First leader Winston Peters. That phrase is, of course, butchered and borrowed from Winston Churchill, who was trying to decipher Russian intentions at the start of World War II. The direction of New Zealand foreign policy under his namesake seems similarly opaque. This presents challenges for Prime Minister Jacinda Ardern, in Paris and London this week, seeking to progress trade deals with the European Union (EU) and Britain. The publicity from the trip is likely to be positive but beyond the photo-ops, what is New Zealand actually doing in foreign affairs? Ardern is certainly getting plenty of photo op opportunities, and she hasn’t visited the Queen yet. Unfortunately for the PM the narrative has been blown off course by the timebomb Peters placed in the coalition agreement – his wish for a free trade deal with Russia. Against a back drop of Russian-Western conflict not seen since the Cold War, uncomfortable questions follow Ardern around Europe. Why, just weeks ago, was her country still clinging to the notion it could pursue a trade deal with Russia? Why did it take so long to drop the idea and why was it there in the first place? An as yet unanswered mystery. The demand to re-start the deal didn’t come from a free trade champion. Peters has largely opposed FTAs, including with South Korea and China. Why did Peters cast doubt on Russia’s role in bringing down MH17 and meddling in the US elections? Why did the government insist there were no Russian spies here and buck the trend of its allies, who expelled Russian diplomats? The questions continue after the missile strikes on Syria. While Australia’s Malcolm Turnbull and Canada’s Justin Trudeau support the strikes, New Zealand “accepts why” they occurred. Perhaps this is what you’d expect from a coalition government with Labour at the helm. Rather than blindly follow their Five Eyes friends they seek an independent path. That line can be traced from Helen Clark’s refusal to join the Iraq War in 2003 to the actions of David Lange and Norman Kirk in protesting nuclear weapons. I don’t remember Kirk or Lange being as vague as Ardern. And then there is Peters, who rarely gives straight answers. What is it that Winston Peters wants to achieve in foreign policy? Both New Zealand First and Labour opposed the TPP in opposition and then supported it in government with minor amendments. It wasn’t much of a surprise to see that Labour was largely in favour of the TPP, despite their opposition when in Opposition. But NZ First’s back flip looks less logical. The tweaks allowed them to ban foreigners buying New Zealand houses but that breached the existing FTA with Singapore. Will Singaporeans be exempt from the ban? Peters stopped by Singapore on his way to Europe this week. Has he settled it? I can’t find any news reports of his Singapore visit, and he hasn’t put out any ministerial release. And what of China? Will it be the job of Winston Peters to take the relationship forward? Will China be receptive to Peters? Important questions. The deeper question is why he wants the job at all. The Greens chose portfolios which visibly align with their philosophies, such as climate change and conservation. For the leader of a party called New Zealand First, which positions itself as a champion of provincial battlers, to take international affairs is a less obvious fit. On the night he announced the government, Peters made dark noises about the failings of capitalism and the challenges facing the economy. And then he chose Foreign Affairs. Trying to figure out Winston may be a fool’s errand. Usually that is a supporting role to the prime minister, who is the country’s real voice on foreign policy. Peters could soon hold both jobs, while Ardern takes maternity leave. That could be interesting – and it could be a risk. Who knows what he will say or do? Will Ardern? Does she work closely with him, or has he been given the freedom to do much as he pleases? Will he be making key decisions while acting PM? Perhaps he’ll hand over foreign affairs to his under-secretary and party deputy Fletcher Tabuteau? Or maybe he’ll keep us guessing. Asking Peters is unlikely to get many answers that are any use to clarifying New Zealand’s foreign policy. I don’t know if Tabuteau would be any better, especially with peters hovering around in charge of the country. If Ardern hands over control. What experience does Tabuteau have with foreign policy and diplomacy? He was an economics lecturer and head of the business school at Waiariki Institute of Technology beforfe becoming an MP in 2014. No sign of offshore experience. There are a number of important unanswered questions about both our foreign policy and our leadership over the next few months. 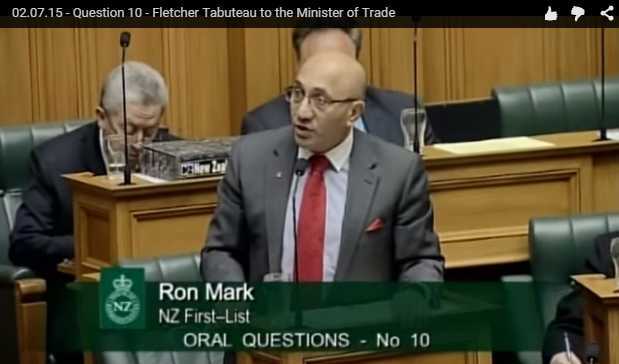 The NZ First caucus yesterday selected Fletcher Tabuteau as their deputy leader, replacing Ron Mark (who is a Minister in the current Government). 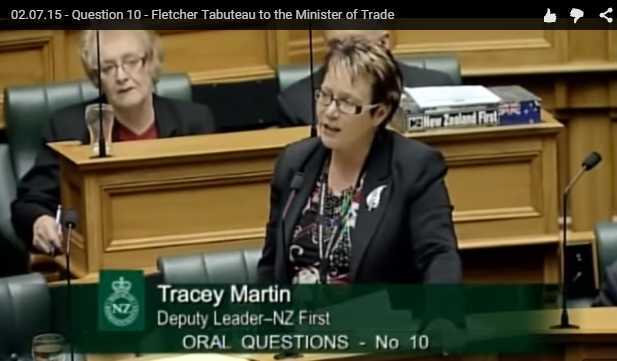 New Zealand First Leader Rt Hon Winston Peters says the new Deputy Leader of New Zealand First is Fletcher Tabuteau MP. “New Zealand First indicated last week that it would consider the deputy-leadership position at its caucus meeting this morning,” said Mr Peters. “New Zealand First extends its immense gratitude for the service of Ron Mark as deputy leader. The party recognises Ron is an integral member of the team and we look forward to him playing a key role in the current government in his capacity as Minister of Defence and Minister of Veterans Affairs,” he said. Fletcher Tabuteau has been a member of the party since its inception and is currently serving second term as a member of parliament. With the formation of the new government he was appointed Parliamentary Under-Secretary to the Minister of Foreign Affairs and to the Minister for Regional Economic Development. It is my honour to announce that today I was successfully nominated as the Deputy Leader of New Zealand First. The role comes with significant responsibility and I am delighted to have received the confidence of my caucus colleagues. I have had the privilege of working with the Rt. Hon. Winston Peters for a number of years and I now look forward to working closely with him and my caucus colleagues as the Deputy Leader. Having been a member of the party since its inception, this step represents my commitment to New Zealand First and its founding principles of putting New Zealand and all New Zealanders first. There is a lot of work to get on with and I am up to the challenge with a great team of people around me. I’d like to take this opportunity to acknowledge my predecessor the Hon Ron Mark who has served as a loyal Deputy Leader of the Party. It is an exciting time to be a part of the fundamental paradigm shift of a new Government as both the Parliamentary Under-Secretary to the Minister of Foreign Affairs and to the Minister for Regional Economic Development, and now as the Deputy Leader of New Zealand First. I look forward to being a part of the party leadership as we look to consolidate the past 25 years and look to the future as an integral part of government, mindful as ever that we will continue to grow our membership and support base. Tabuteau is aged 47. He became an MP via the NZ First list in 2014 and again in 2017 – he was ranked fourth on the list both times, ahead of Mark (who was 9th) in 2014, but two places behind Mark in 2017. 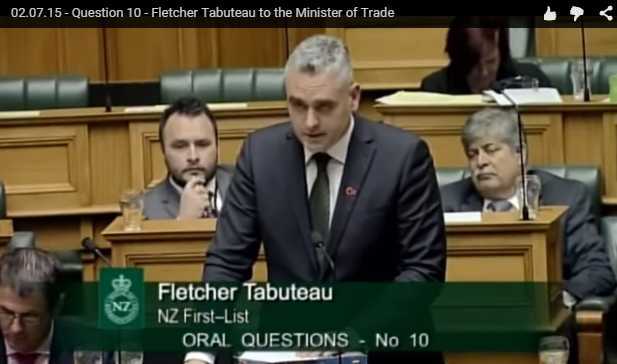 After the formation of a Labour-NZ First-Green government in October 2017 Tabuteau was appointed Parliamentary Under-Secretary to the Minister of Foreign Affairs, Winston Peters, and Under-Secretary to the Minister for Regional Economic Development, Shane Jones. This looks a bit like a succession plan for NZ First, but while Peters remains leader Tabuteau may have difficulty building much of a profile. There has never been any doubt who will lead NZ First while Winston Peters remains an MP, but the deputy spot is less secure. In 2015 Ron Mark got the numbers to oust Tracey Martin, but it looks like the knives are out for Mark, with the position up for a caucus vote next week. Martin and Shane Jones appear to be too busy to consider going for it, so it looks like the way is open to Fletcher Tabuteau to take on some more responsibility. They say what goes around comes around and in Ron Mark’s case he’ll be hoping that’s not the case. Mark rose to be NZ First’s deputy leader in 2015 after he challenged Tracey Martin and got enough support in the caucus to roll her. But the party’s deputy leadership is up for grabs again on Tuesday and it’s understood the job is NZ First MP Fletcher Tabuteau’s – if he wants it. Tabuteau was fourth on the NZ First list last election, behind Peters, Mark and Martin (Jones was 8th). Mark need not worry about Martin, whose popularity amongst colleagues exceeds his, as it’s understood she’s not interested in the job due to her heavy ministerial workload. NZ First new-comer but old-timer in terms of political experience, Shane Jones, has long been touted to take over the leadership from Winston Peters if he ever decided to throw it all in and head to Whananaki to retire. But he’s not interested in the job either – he says he’s got one billion trees to plant and a $1 billion regional economic fund to spend, which would keep him far too busy for anything else. So it looks like a contest between Mark and Tabuteau, if Mark doesn’t read the writing on the wall and say he’s too busy being a minister. While he (Jones) says it’s not a “priority” for him to be deputy leader and in the short term he has a “hell of a role” he possibly also doesn’t see the deputy job as any sort of assumed stepping stone to the leadership. The issue of tax paid (or lack or tax paid) by multinational companies came up in Parliament’s Question Time yesterday. That sounds like dramatic underpayment of tax but it lacks a lot of detail. In many cases much of the cost of sales from multinational companies is incurred overseas and the sales are recorded overseas. That’s standard waffle from English, and his following responses didn’t add much. But Tabuteau came up with two examples. That seems interesting but it is misleading, as his next question shows. So Mastercard and Visa together shared in “the same pool of credit card billings of $40 billion”. And that is not their sales, it is the sales of many companies who use credit card services so people can pay for goods and services. It doesn’t separate domestic versus international sales. Credit card charges are only a small part of overall sales, a few percent at most. If you pay Inland Revenue by credit card the fee paid to Westpac is 1.42%, if you pay the Police the fee is 1.9%. It is obvious from this that some of the $40b are not sales but are payments with no revenue or tax involved. One percent of $40b is $400 million, still a substantial amount. But there will be significant costs involved in providing the service and providing the finance – banks provide finance free of interest for up a month and a half. So the detail Tabuteau is insufficient to have any ideas how outraged to be about how little revenue Mastercard and Visa report and how little tax they pay. I don’t know how things are structured between the banks and the credit card companies. It looks like the banks incur most of the costs and will get most of the sales value from transactions. That’s little more than a vague assertion of abuse. Without details Tabuteau has embellished his claims and made a very weak argument. The TPPA: Don’t Sign meeting will be held at the Auckland Town Hall tonight at 7 pm. It will be live streamed at The Daily Blog. Grant Robertson, Labour; Metiria Turei, Greens; Marama Fox, Maori Party; and Fletcher Tabuteau, NZ First. The speaking tour is being sponsored by Its Our Future, Action Station, NZ Council of Trade Unions and First Union. Perhaps there’s no workers involved in export or import companies in NZ Council of Trade Unions or First Union. Interesting to see Labour’s finance spokesperson Grant Robertson opposing the signing and opposing the TPPA. Yes, it is our future, and how that works out for New Zealand will depend on trade. The Trans Pacific Partnership should improve trade opportunities a bit. Asked whether the party had a succession plan, Mr Peters said he’s “probably got 10 successors – that’s how much talent we’ve got in New Zealand First”. Some of this talent was on display during Question Time in Parliament today. Both deputy aspirants seemed to be trying to be young Winstons, without vast experience and without success. (c) discreditable references to the House or any member of Parliament or any offensive or unparliamentary expression. (2) Questions must not seek a legal opinion. (3) A written question must not repeat the substance of a question already lodged in the same calendar year. (4) Questions must not refer to proceedings in committee at meetings closed to the public until those proceedings are reported to the House or (subject to Standing Order 115) to a matter awaiting or under adjudication in, or suppressed by an order of, any New Zealand court. (5) Where the notice of a question does not comply with the provisions of the Standing Orders, it is not accepted. If, by inadvertence, such a notice is accepted it may be subsequently disallowed by the Speaker unless it is amended or revised so as to comply with the Standing Orders.